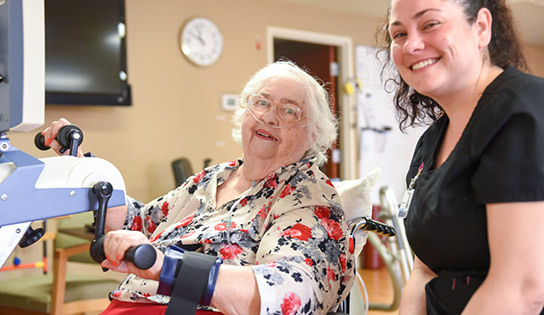 On January 9, 2018, Mary Brewster transported from home to receive therapy due to extreme weakness. Upon arrival, Mary was greeted by the floor nurse and floor techs. Over the course of the week, she received a therapy evaluation to be able to begin therapy, met with the nutritional team to pick and choose her healthy meals, activities discussed the daily therapeutic recreation calendar, and then she met with the Concierge Director to ensure things are going well and her stay at Gallatin Center was excellent while being healing at the community. Mary subjected her stay at Gallatin Center as beneficial. She also shared that her therapy was great and the people were very pleasant. Mary stated “I can get around better and walk a lot better.” Mary will be returning home on the 8th of February. We send Mary our thoughts and prayers and hope nothing but the best for her and her family! We know she will continue to do wonderful progress and healing.